Chromium is a mineral that humans require in trace amounts. It's found in small quantities in foods such as brewer's yeast, calf liver, whole grains, processed meats, and cheese. In 1959, chromium was first identified as an element that enables the hormone insulin to function properly. Since then, chromium has been studied for diabetes and has become a popular dietary supplement. It is widely available in health food stores, drug stores and online. Chromium is believed to help the body process carbohydrates and fats. It is marketed as a weight loss aid for dieters and an ergogenic (muscle-building) aid for bodybuilders and athletes. One form, chromium picolinate, is popular because it is one of the more easily absorbed forms. Research on the benefits of chromium to enhance fat loss and increase performance in bodybuilders and athletes has provided mixed results. According to the Natural Medicines Database, "early evidence that shows that taking chromium while participating in resistance training can increase weight loss, body fat loss, and lean body mass. However, most reliable research shows that taking chromium by mouth does not enhance bodybuilding, strength, or lean body mass." Chromium picolinate is also used in the treatment of diabetes and depression. However, more studies are needed to fully understand the relationship between chromium and these conditions. Research is ongoing. Currently, there is not enough evidence to support the use of chromium supplements for these uses. In 1995, a study headed by Diane Stearns, Ph.D., at Dartmouth College generated controversy about the safety of chromium picolinate. The researchers added high concentrations of chromium picolinate, chromium chloride or chromium nicotinate to hamster cells in culture and found that only chromium picolinate could damage the genetic material of the hamster cells. Since then, other laboratory studies using cell cultures and animals have suggested chromium picolinate causes oxidative stress and DNA damage. 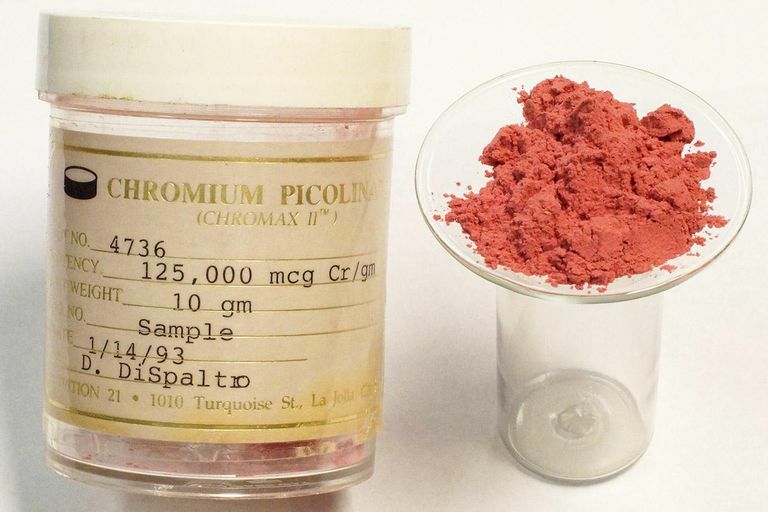 Critics say that the scientists used unrealistically high doses and that administering chromium to cells in test tubes is not the same as taking chromium supplements orally. The woman was being actively treated with antipsychotic medication, so it’s difficult to say whether it was the chromium, the combination of chromium with the medication, or another medical problem that was responsible for the reaction. In a separate case report, a 24-year-old man who had been taking a supplement containing chromium picolinate for two weeks during his workout sessions developed acute kidney failure. Although chromium picolinate was the suspected cause, it's important to note that there were other ingredients in the supplement which may have been responsible. Chromium picolinate, in high amounts, may have an additive effect if combined with diabetes medication and cause blood glucose levels to dip too low. It's important to talk to your doctor before taking any form of chromium if you are also taking diabetes medication. Your body needs very small amounts (an average of 0.025 mg a day) of chromium every day. However, according to medical sources, adequate amounts are usually obtained in the diet from foods such as American cheese, meat, fish, fruits, and whole grains. There is not enough scientific information to establish safe and tolerable upper intake levels of chromium. Chromium picolinate is one of the most popular supplements sold in vitamin shops and natural food stores. You may also find this supplement in your local grocery store. However, supplements haven't been tested for safety and due to the fact that dietary supplements are largely unregulated, the content of some products may differ from what is specified on the product label. You can get tips on using supplements, but if you're considering the use of chromium or any other form of alternative medicine, talk with your primary care provider first. Self-treating a condition and avoiding or delaying standard care may have serious consequences. Bailey MM, Boohaker JG, Sawyer RD, Behling JE, Rasco JF, Jernigan JJ, Hood RD, Vincent JB. "Exposure of pregnant mice to chromium picolinate results in skeletal defects in their offspring." Birth Defects Research, Part B, Developmental and Reproductive Toxicology. 77.3 (2006):244-249. Cerulli J, Grabe DW, Gauthier I, Malone M, McGoldrick MD. "Chromium picolinate toxicity." The Annals of Pharmacotherapy. 32.4 (1998): 428-431. Coryell VH, Stearns DM. "Molecular analysis of hprt mutations induced by chromium picolinate in CHO AA8 cells." Mutation Research. 610.1-2 (2006): 114-123. Vincent JB. The potential value and toxicity of chromium picolinate as a nutritional supplement, weight loss agent, and muscle development agent. Sports Medicine. 33.3 (2003): 213-230. Wani S, Weskamp C, Marple J, Spry L. "Acute tubular necrosis associated with chromium picolinate-containing dietary supplement." The Annals of Pharmacotherapy. 40.3 (2006): 563-566. Young PC, Turiansky GW, Bonner MW, Benson PM. "Acute generalized exanthematous pustulosis induced by chromium picolinate." Journal of the American Academy of Dermatology. 41.5 (1999): 820-823. Chromium. Professional Monograph. Natural Medicines. 1/3/2019.